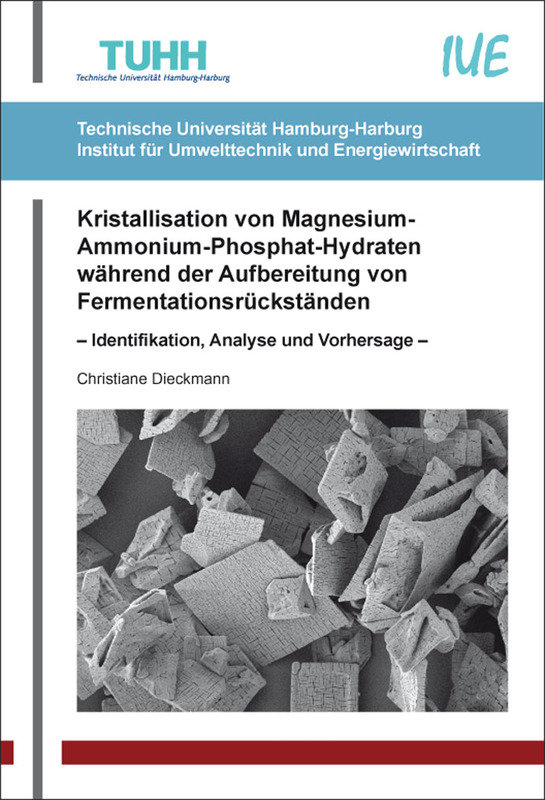 Kristallisation von Magnesium-Ammonium-Phosphat-Hydraten während der Aufbereitung von Fermentationsrückständen. Dissertation (english) von Christiane Dieckmann, Verlag Dr. Kovač 2018, 288 S.
Biogas technology plays a key role in the sustainable use of biomass resources in terms of material and energy. Biogas or biomethane is versatile in electricity, heat and fuel production and can be used in the chemical industry. In order to ensure an efficient utilization of the biomass used, the application of overall process concepts is important. These include for example the processing of digestate into transportable and storable fertilizer products. Corresponding treatment methods are generally available, but often lead to problems in their large-scale implementation. For example, an uncontrolled crystallization of the ions ammonium (NH4), magnesium (Mg) and phosphate (PO4) contained in the fermentation residues leads to the formation of insoluble MAP deposits. Narrowed pipe sections or damaged equipment are the result.To circumvent them, either the prevention of MAP crystallization by adjusting the process parameters or the controlled precipitation and subsequent separation of the MAP crystals offers a potential solution. Independent of the approach, however, a comprehensive understanding of MAP crystallization under the conditions of a treatment process is required. In order to generate this understanding of the system, in this work the chemical and thermodynamic basics of precipitation crystallization are elaborated and the current state of knowledge regarding MAP crystallization is investigated. The influence of temperature is considered in more detail, since this determines not only the yield but also the composition of the resulting solid phase or rather the MAP hydrate form. The combined consideration of thermodynamic and chemical relationships as well as the analysis of numerous experimental data provides a comprehensive understanding of MAP formation. All main and interaction effects of the influencing factors are mapped by mathematical model equations, so that a prediction of the MAP formation is made possible and appropriate recommendations for the prevention of MAP deposits can be derived.